The population of Tibetan antelopes in Hol Xil, a key nature reserve in northwest China for the endangered animal, has increased to 60,000 from less than 20,000 in 10 years. increased to 60,000 from less than 20,000 in 10 years. Cega, director of the Hol Xil Natural Reserve Administration in Qinghai Province, attributed the increase to the improved environment and anti-poaching efforts. Armed poaching led to a drastic decline in the antelope population at one point. There were only 20,000 left in Hol Xil when rangers started to fight against the illegal practice in February 1998. The Hol Xil administration has organized more than 300 patrols in the past decade, covering nearly 700,000 kilometers. They have cracked more than 100 cases of armed poaching and seized approximately 4,000 Tibetan antelope furs, Cega said. The administration also sent rangers to guard Tibetan antelopes during their migration, which eliminated armed poaching as of 2005. 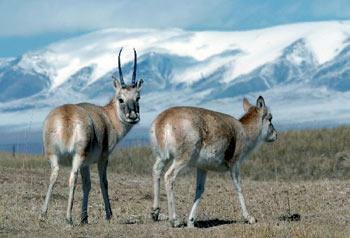 The Tibet-Qinghai Plateau is the habitat of Tibetan antelopes, a rare species exclusive to China and recognized as an endangered species since 1979. The nimble, athletic animal was selected as Fuwa Yingying, a mascot for the Beijing Olympics. However, the antelopes became a target of poachers during the 1980s. International traffickers make shahtoosh shawls, a luxury pashmina product that requires the pelts of three to five Tibetan antelopes to make one.